One of the things that I like about catching a ride with Uber or Lyft is that I can enjoy a little photography along the way. 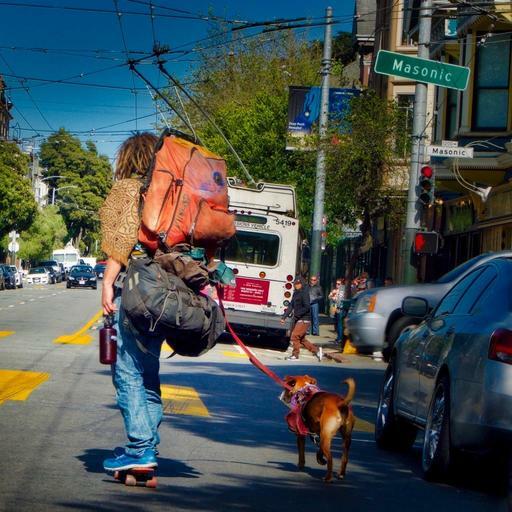 "Skateboarder with Dog" - Captured from the front seat of an Uber ride when leaving Haight Ashbury for downtown SF. Olympus PEN-F, 14-42mm EZ lens, processed in Photos for macOS with the Luminar 2018 editing extension. Photo by Derrick Story. I've never had a problem taking a seat in the front with either Uber or Lyft drivers. This enables me to shoot both ahead, and to the side. I do ask before rolling down the side window, however. As for the straight-ahead shots, I pay close attention to the reflections in the windshield. Many times, especially in big cities with tall buildings, they're not a problem. But when on the open highway in bright sun, they can present a challenge. I typically use a compact zoom lens for this type of photography. My goal, besides getting the shot, is not to appear too serious or professional. I don't want to make the driver or the subjects uncomfortable. I'm just a tourist enthralled by the exciting sights and sounds of the city. Letting someone else drive the car has so many advantages, including the bounty of photo opportunities. Maybe someday, when self-driving cars become the norm, this will become even easier.